When it comes to luxury, one thing is for sure – there is plenty of it, if you’ve got the cash. If, like us, you’ve got holiday plans much deeper than your pockets and just love to imagine yourself on a dream holiday in one of the world’s most luxurious hotels, then we’ve got some eye candy for you. Dream on…. Let’s start, as perhaps all things should, in Paris. Just off the Champs Elysees in an eight storey landmark building, the Four Seasons Hotel George V oozes chic Parisian style. The penthouse has an incredible view of the Eiffel Tower, naturellement, the wine cellar is second-to-none and the Suite Parisienne might be my idea of heaven. Want a slice of the action for less? Try afternoon tea in La Galerie where a pianist plays and the walls are adorned with Flemish tapestries and objects d’art. 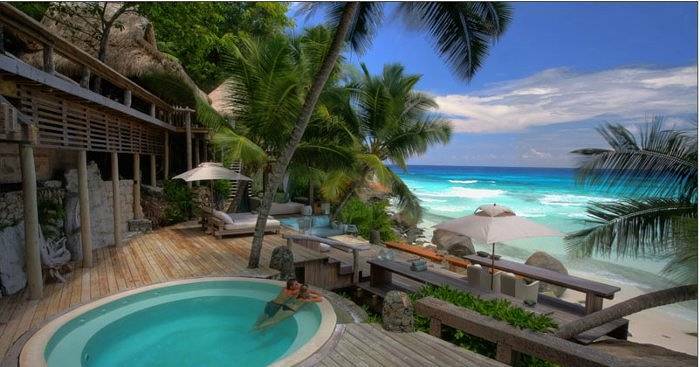 If it’s good enough for Wills and Kate’s honeymoon, then it’s good enough for me! 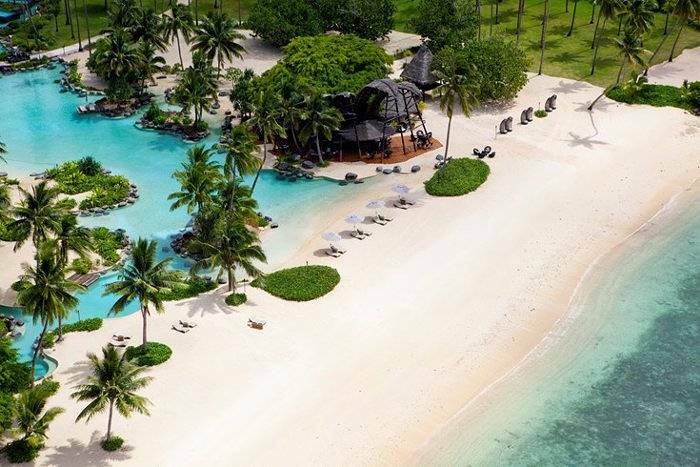 This private island has a handful of villas, a stunning beach aptly named Honeymoon Beach, a dive centre and of course, a helipad. I mean, how else would you arrive? It’s all about getting back to nature here, but don’t expect them to scrimp on the luxury, with a wine cellar, spa and private picnics available too. What could be better than staying in your very own Sultan’s palace – and one with a pretty ridiculous history at that. Built in the 1860s out of colourful marble and wood, it burnt down not long after its creation, with the outside marble walls remaining. Inside became a football stadium for a while, but today it’s been restored to its former glory. 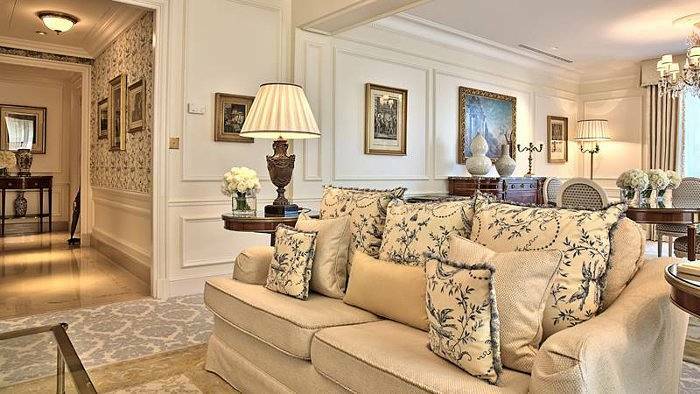 Sitting on the banks of the Bosphorus you get incredible views to go with the exquisite decor, and in the Palace Suite your own butler as well! If I started listing all the awards won by this hotel there would be no room for anything else – suffice it to say, it’s highly decorated! 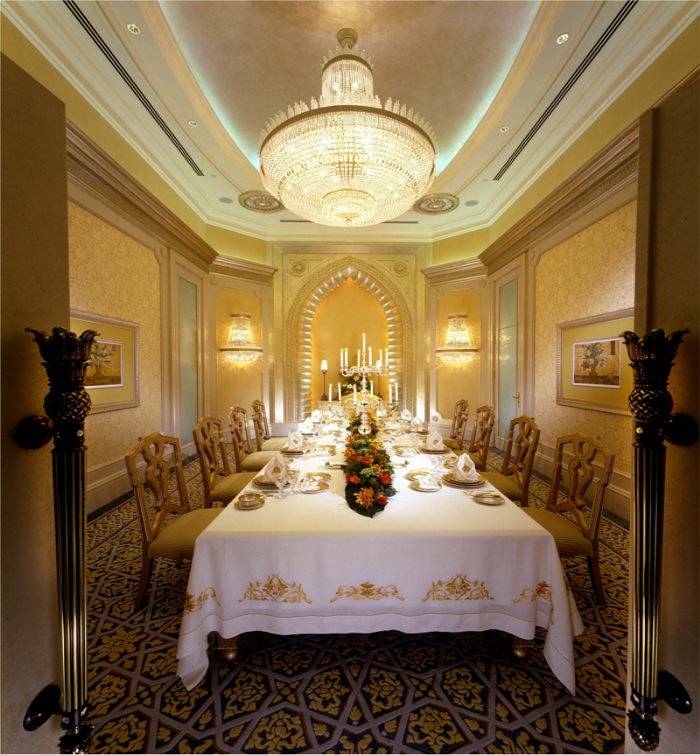 Glitteringly opulent and extravagantly decadent, if you stay here they even arrange camel or elephant tours to the Amber Fort and around Jaipur, so the luxury can continue even outside the hotel. You’d be forgiven for mistaking it for a museum in places, with a huge antique crockery collection and truly jaw-dropping chandeliers in amongst the other décor. Move over Burj al Arab, there’s a new kid in the Emirates, and it’s got all the credentials you’d expect. 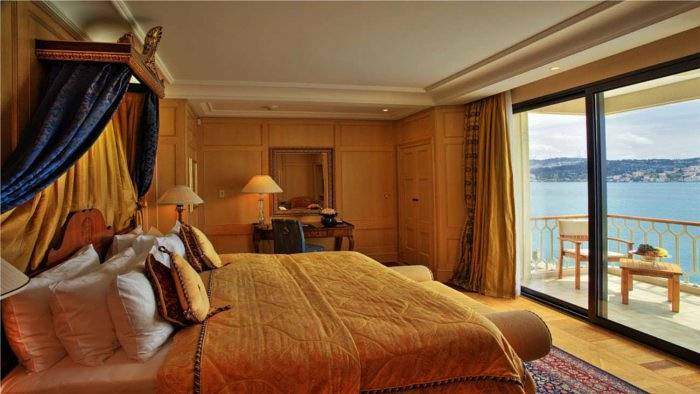 There’s the huge pricetag, swanky suites, and of course, its own marina. Well, where else would you park your yacht? There’s a white sand beach, an incredible 14 restaurants and bars, and a luxury spa showcasing the hotel’s beauty and the Emirati heritage. History, location and style come together in Rome at the Westin Excelsior, where the suites have welcomed more than their fair share of celebrities and artists since opening in 1906. 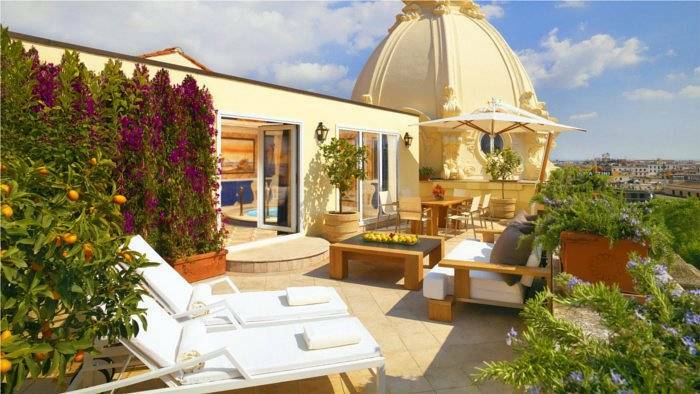 The only way to experience this hotel is by staying in one of their 35 suites, although we won’t tell if you just want to pop to their h club>doney – Rome’s “most lavish street café” to sample the atmosphere. 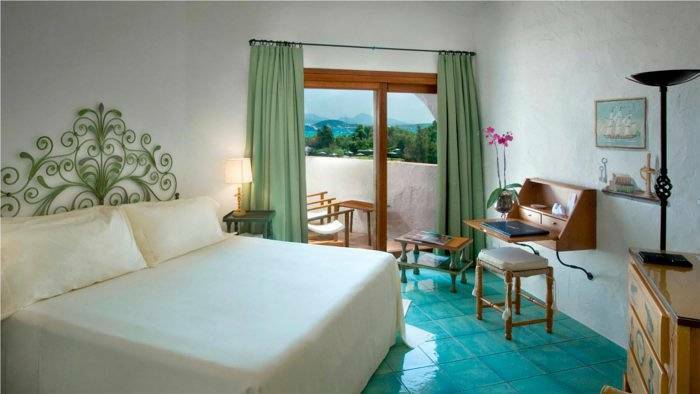 The Villa la Cupola is the country’s largest suite and features a frescoed cupola, huge bath and private terrace. From city chic to rural retreat, this hideaway is all about rural elegance, with stunningly designed wide open spaces and sea views in spades. All rooms have one, as do many of the restaurants, and you can even check out the view right now with their live web cam. There is an outdoor pool, also with stunning views of course, hideaways for a romantic date and a huge golf course with private sandy beach just next door. Just edging out its sister hotel, Atlantis the Palm in Dubai, this hotel sits on its own island, and is as epic as a theme park, with six separate places to stay, huge water park, casino and the world’s largest open-air marine habitat. You might even spot the lost city of Atlantis! There’s no need to ever leave the hotel, with scuba diving, swimming with dolphins, a shopping plaza around the obligatory Marina and more besides – remember to pack the extra credit card! No more words are necessary. Fiji. Island. Resort. 3,500 acres of coconut plantations, verdant mountains and sandy beaches are yours at this island, and you could enjoy it in blissful solitude at one of the private villas – they will even bring your meals to you. There is surfing, scuba diving, golf and even resident artists, whilst dining incorporates as much produce grown on the island as possible, for a back-to-basics approach in the surroundings of utmost luxury. 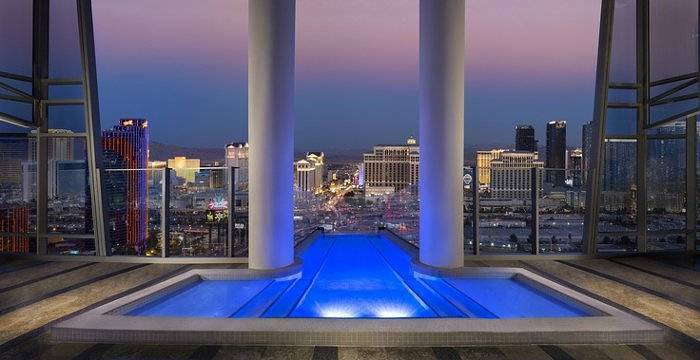 You can’t have a luxury list without Las Vegas, the city that’s built on the high-rolling lifestyle. Palms Place might just be the crème de la crème from its casino right up to its several penthouses and suites. The two-story Sky Villa is the pick of the bunch, but you’re going to have to win big to stay here. For a slice of the pie on the cheap, check out The View, which bills itself as a casual lounge-meets-rec room. Naturally it also boasts one of the best views on The Strip.